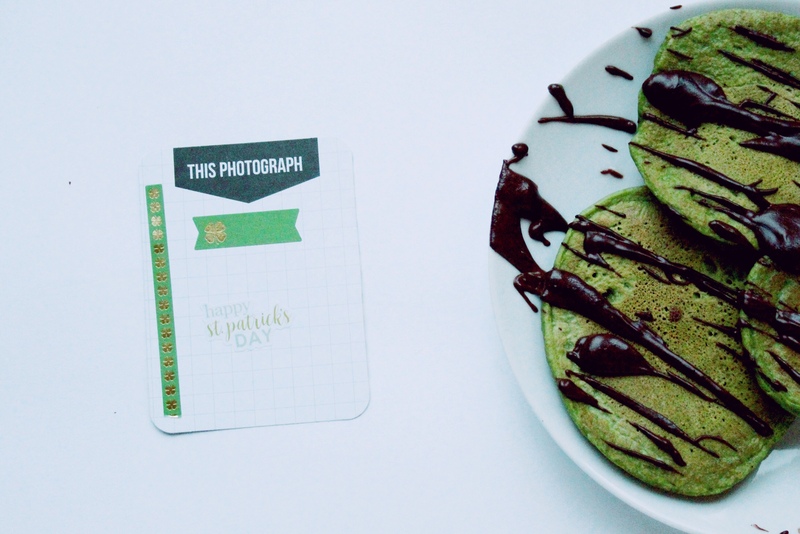 What do health bloggers do every time St Patrick’s Day rolls around? You got it – put spinach or kale in everything. Sometimes both, if we’re feeling really wild. 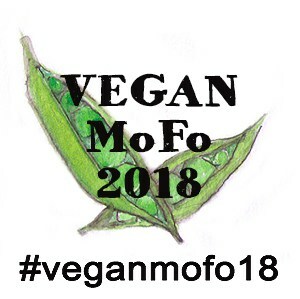 To honour that tradition, I’ve created a clean and vegan shamrock pancake recipe this year. It’s high in protein, high in nutrients and really high in spinach! The batter only takes a few minutes to pull together, and then it’s ready to hit the pan. The pancakes are also completely Tone It Up approved! And if that’s not enough to convince you, I’ve included a dark chocolate ganache topping. You can never have enough chocolate, right? 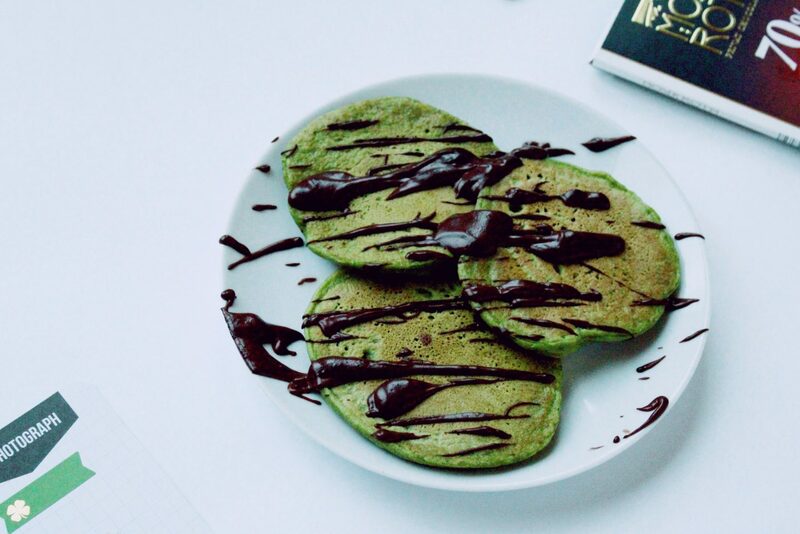 Isla and I had a fantastic time making our vegan shamrock pancakes. Initially she was a bit upset that I had apparently made a green smoothie and then dumped it into a frying pan, but she quickly caught on. She was so incredibly excited by the concept of bright green pancakes – to be two years old again! 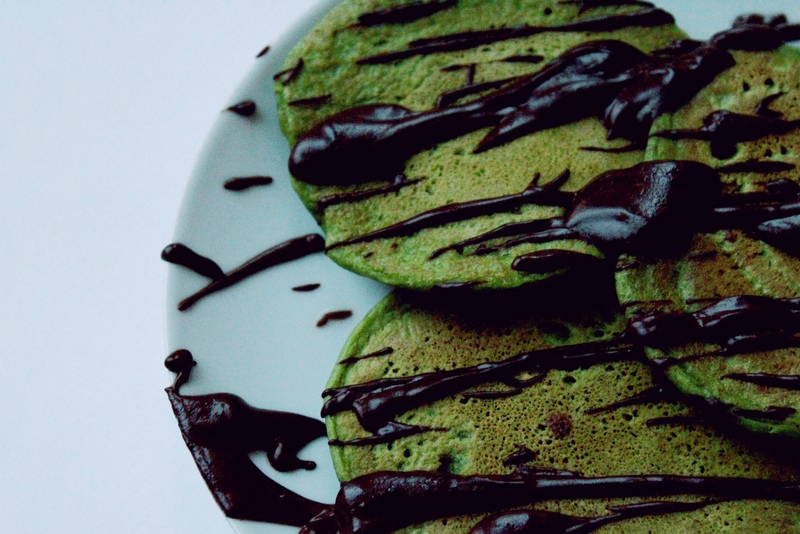 Just a note on green pancakes: I always have a bit of an inner conflict going on when it comes to making themed, brightly-coloured foods for holidays and occasions. On one hand, I want to feed my family and myself as naturally as possible, basing our diet on whole foods. On the other, I also totally embrace the fun and the possibilities that food colouring and the likes offer, and don’t really consider them a problem if kept to special occasions rather than every-day consumption. I can’t really work out where I stand with this, so I’ve just decided to embrace both options. If I have to use food colouring for a particular result, so be it. 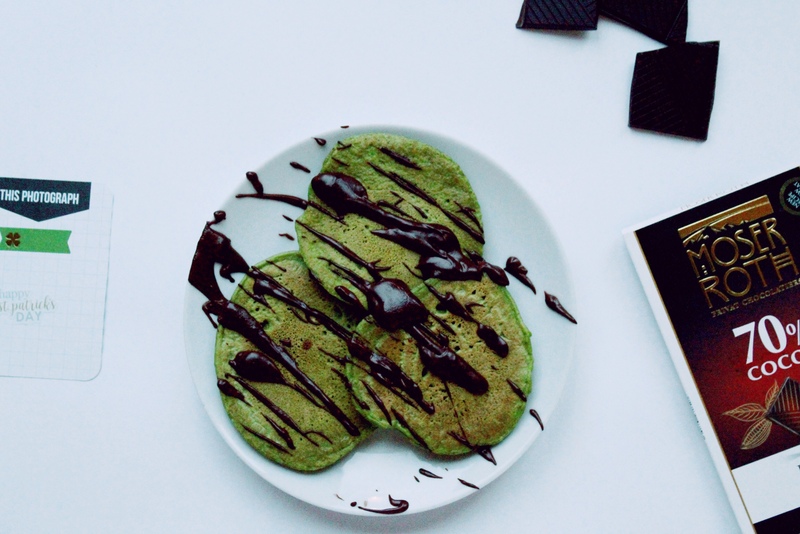 If a natural ingredient, like spinach in these vegan shamrock pancakes, will do the trick, I’ll go for it. 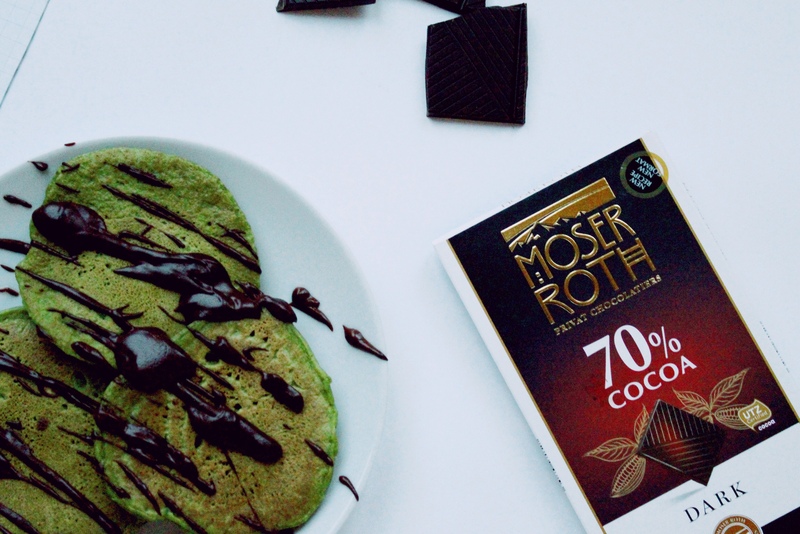 It’s a nutrient-dense ingredient, it makes everything brilliantly green, it distributes itself well in batter and you can’t really taste it. Perfect, what’s not to like? In a blender, blend until smooth the water, non-dairy milk and spinach. Add the vanilla, protein powder, flax, spelt flour, almond flour, baking powder and bicarb and blend until you have a smooth batter. It should be pourable, but only just - add a little more water or milk if you need to. Heat the coconut oil in a pan and drop in roughly 2 tbsp of batter per pancake. Cook until golden brown on the bottom, then flip and cook until done. Repeat until you're out of batter. When all your pancakes are done, melt the chocolate into the cream over low heat. Stir until completely smooth, then use to top your pancakes and serve!